TRACY, Calif. — On an early October morning, a mix of six kindergarten and third-grade teachers walked into Andrea Easley’s third grade classroom in Tracy, California to teach a science lesson. Students stared eagerly at the newcomers as Easley positioned herself the front of the classroom. “Today we are going to do another experiment,” Easley said. “Yay!” the third graders cheered, some jumping out of their chairs in excitement. Most of the teachers who were with Easley that day had never witnessed that kind of reaction from students when it came to learning science. Three weeks earlier, 12 teachers, including the six in Easley’s classroom, had met to plan their first lesson as part of California’s Next Generation Science Standards pilot program. They split into two groups and chose two classrooms — one kindergarten and one third grade — in which to collectively teach a science lesson. The national Next Generation Science Standards were established in April 2013 with the goal of improving the country’s performance in science, technology, engineering and math — often called the STEM fields. Twenty-six states have adopted the standards. Although they are not part of the Common Core Standards, which focus on language arts and math, the idea behind the science standards is very similar to that of Common Core: less emphasis on rote memorization of facts in favor of teaching a deeper understanding of scientific principles. The pilot program in California, now in its second year, was developed and directed by the K-12 Alliance, the science and math arm of the research non-profit WestED. The Alliance is training the teachers in the standards and overseeing the planning and implementation of lessons. The goal is to teach students how to develop hypotheses, test models and make evidence-based predictions. Tracy Unified is one of 10 California districts participating in the pilot program. The others are Oakland, Galt, Vista, Lakeside, Palm Springs, Kings Canyon, San Diego, and two charter districts, Aspire and High Tech High. “What happens when I add two books?” Maria Villasenor, a kindergarten teacher, asked her group of four third graders. 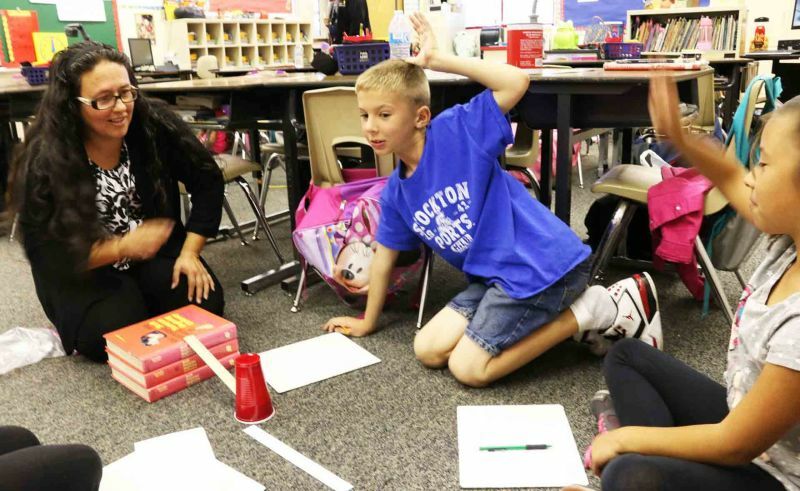 The students’ first trial had shown that with one textbook, the cup traveled one inch, a fact each third grader promptly wrote down on a sheet of paper. “It’s going to go farther,” Taylor Griffin, 8, responded, referring to the red Solo cup located at the bottom of the ruler. Sure enough, the cup traveled twice as far as it had when there was one book. “Two inches,” Griffin said enthusiastically. “Would you say there’s a pattern?” Villasenor asked the group. “Yes,” the four students replied in unison. “What would happen if we put five books under the ruler?” Villasenor asked. For the most part, the third graders appeared to understand the experiment and were able to adequately convey their understanding in written responses at the end of the lesson. The lesson was simpler for the kindergarteners. Without being asked to record their data, they were able to predict that the cup would move farther with more books under the ruler. In a group discussion after the experiment, many students were able to accurately describe the forces that caused the cup to move. The Tracy teachers, none of whom has a strong background in science, had expressed concern about their ability to teach the subject. When they finished the day’s two short lessons, the teachers were as enthused as their students. The new approach, coupled with attendance at some preparatory summer sessions, increased their confidence, they said. Jody Sherriff, one of the Alliance’s regional directors, oversees the teaching teams in both the Tracy and Galt districts. A former middle school teacher, Sherriff started using similar methods to teach science in the 1990s. She expressed cautious optimism after the first two lessons in Tracy. The hope, according to DiRanna and Sherriff, is that the 10 districts currently participating in the pilot program will serve as examples for other districts in the state. Jonathan Osborne, a professor of science education at Stanford University and one of the developers of the science standards framework, said it is too early to say whether the effort will help meet the long-term goals of getting students to think about careers in science. But the enthusiasm of the students in the two Tracy classrooms was a good beginning, he said. Other education researchers are more skeptical about California’s science standards. The Thomas B. Fordham Institute, an independent education foundation, found the standards to be mediocre at best. In a report released two years ago, it gave California’s former science standards an A grade and the new standards a C.
The teachers in Tracy finished both lessons by lunchtime. At the end of the third grade session, Debbie Patterson, who normally teaches a different third grade class in the same school, asked the students to provide a written explanation for what caused the cup to move farther as the ramp was raised. After gathering the papers, the teachers left the classroom to discuss the lesson in the staff lounge, where they read the responses and divided them into four categories: fully understood the lesson, mostly understood the lesson, partly understood the lesson, and did not understand the lesson at all. The group’s leader, Sherriff, gave the toughest feedback. “They think we are trying to trick them and asking them to come up with something new,” Easley said in response to the many papers falling into the “did not fully understand/did not understand” categories. “That’s because we did that for so many years,” Sherriff replied. The Tracy teachers have several weeks to reassess and develop their methods: the next planning session in the pilot program will take place in early 2016.